WETHERSFIELD — In late July Aetna’s office received a patient satisfaction survey from a patient treated in Wethersfield in June by Eric Thepsiri and Donna Achilli. The patient had checked off every box with “Strongly Agree” to questions like, the Paramedic was highly skilled, kept you informed, relieved pain and anxiety. 15 boxes in total. When asked to use a word or phrase to describe the crew the patient wrote, Fabulous!!. Note: Run #16-47131, certain information redacted for privacy. Scattered strong to severe thunderstorms may develop after 4 pm Friday afternoon and last to at least 11 pm. Western and Northern Massachusetts as well as Northern CT have the best potential to see strong to severe thunderstorms. Cannot rule out strong storms across RI and Eastern MA during the overnight hours on Friday into early Saturday morning. Main threats within these storms will be damaging winds, hail, and heavy downpours which could lead to localized minor street flooding. An a isolated tornado cannot be ruled out. The coverage of thunderstorms (scattered vs widespread event). If storms will weaken or strengthen as they move eastward into RI and Eastern MA Friday evening into Friday night. Heat and humidity will return beginning Friday and last into the weekend. Temperatures will warm into the low to mid 90s on both Friday and Saturday. Heat Indices could reach the mid 90s on Friday and low 90s on Saturday. Sunday will also be warm with temps in the low 90s. They were great. Kind, professional and caring. (16-43478; T. LaChappelle, A. Linardo). I was very nervous, their kindness + comfort were so appreciated. Wonderful people – Super job done. (16-44248; R. Jones, M. Pierce). They showed concern, asked appropriate questions, checked on my comfort. Professional. M + R did an excellent job. Thank you! (16-44752; M. Tuttle, R. Fraley). They were helpful, fast, caring & professional. J Thank you for all the help. (16-44293; A. Debisschop, A. Hernandez). Very courteous + highly efficient. R + R were terrific. Their assessment + care were very professional. They made sure I was safe + secure right into the ER room. We were very pleased with all that R + R did. (16-45368; R. Bilodeau, R. Fross). They were very professional + caring individuals through my entire situation. (16-39950; E. Snoek, R. Bochman). Professional, compassionate & well trained. The entire crew was great. They were calm and kept me calm and comforted. (16-40155; J. Rasmussen, S. Yenco with East Hartford Fire Department). Professional, seemed very well trained. 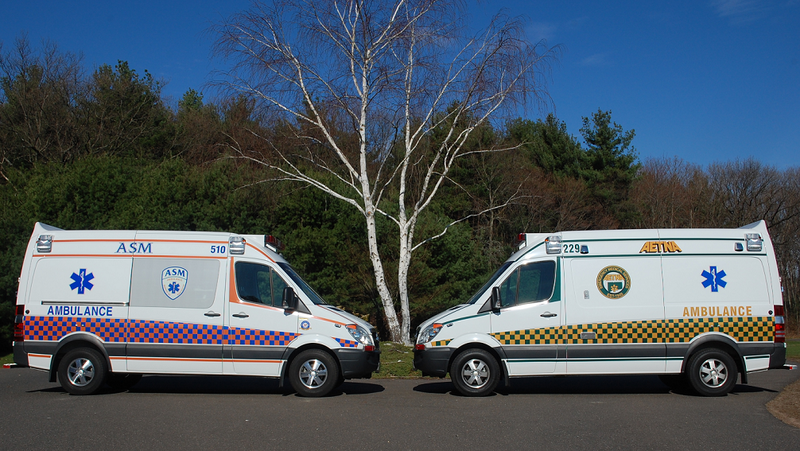 Note: ASM is NOT the ambulance transport or paramedic service provider in Willimantic. In an emergency, always dial 9-1-1. WILLIMANTIC — I know the 4th has come and gone, but ASM is still America Strong! It was another successful year at the annual Boom Box Parade in Willimantic. ASM, in our traditional orange and blue, proudly wore red, white and blue to celebrate with the rest of the crowd for the momentous occasion. The radio set to the 1400 WILI AM station as they played the parade music, a tradition that began in 1986 when no marching band was available for the parade. This year’s parade was held in 82 degree weather and lasted 96 minutes, the longest since the record breaker of 117 min in 2010. I enjoy the reactions from the parade goers, young and old, with great big smiles, waves and cheers. We may not be the first responders in the town, but they know who we are and they seem to appreciate us here. It’s an event I look forward to every year! Extremely professional, caring, calming. It was a terrible snowstorm and they got him from physician’s office to hospital safely. The greatest team. Good people. I was unconscious, however by son said that the ambulance came very quick and the paramedics knew what they were doing. (16-38122; K. Beaulieu, K. Ringuette with East Hartford Fire Department). Great especially when I was in need! They made both of us (me as a rider to the hospital) and my husband very calm and comfortable. (16-38562; R. Bilodeau, P. Gleason). They were great. Outstanding. Thank you. The Best. (16-39540; R. Houser, L. Adamowich). Very satisfied. Chris was [in back with me] – he was extremely kind and explained everything before doing it. He is excellent!!! (16-39795; patient referencing Manchester Fire Rescue EMS paramedic with ASM). 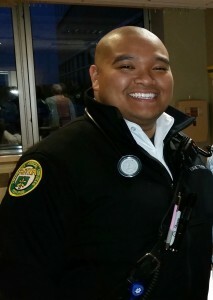 Extremely caring & knowledgeable paramedic. Thank you. (16-39265; T. Oliver). Compassionate, caring, respectful. (16-40355; J. Rasmussen, R. Fross). Very professional, efficient and caring. The crew was caring, compassionate and very knowledgeable. (16-41105; C. Everest, C. Tevnan with Manchester Fire Rescue EMS). Thank you for your skill and compassion. (16-41751; T. Armas, C. Lemire with East Hartford Fire Department).